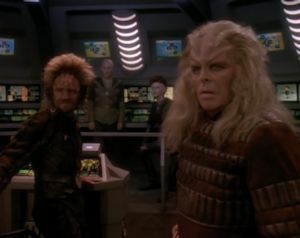 While tracking a group of mercenaries who appear to be responsible for Captain Picard's death, Riker is kidnapped and thrown into the middle of a strange archaeological expedition. Troi and Crusher aren't very good at this covert espionage business. They're both too clean-cut and pretty to pull it off properly, whereas Riker has at least made himself look scruffy and Worf is, well, Worf. Using the off-screen death of Picard as a hook is pretty weak. The audience of course won't believe it, and having the crew yet again cope with the loss of a crewmember who hasn't actually died (as in "The Most Toys" and "The Next Phase") promises to be tiresome. Indeed, as soon as the show starts up again, there's a scene involving Riker and Troi attempting to deal with the hurt and anger of Picard's "death," and it just rings awfully hollow, lacking the emotional punch it needs to be worth anything. Following that, Riker talks with an admiral, and the scene is far less impactful than a similar scene in "The Best of Both Words, Part II." Sometimes, I wish Data had a spin-off show in which he is the captain of his own vessel. I love it whenever he takes command. When did Saavik become a Romulan? As with the previous episode, there's a lot of recycled plot devices from the TNG toolkit on display here. The undercover intrigue feels almost identical to "Face of the Enemy"; the pain-inducing neural implants are ripped right out of "Chain of Command, Part II"; and the opening espionage stuff was done much better in "Unification." Having said that, there's the potential for a fun adventure yarn going forward, so I'll save any further criticism for the second half. Copyright ©2012 e. magill. All rights reserved.